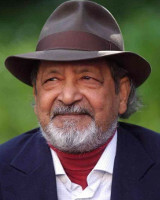 Vidiadhar Surajprasad Naipaul 17 August 1932 British, Trinidadian Seepersad Naipaul Droapatie Journalist, Novelist, Author, Essayist British writer known for his comic early novels set in Trinidad and Tobago. He has published more than 30 books, both of fiction and nonfiction, over some 50 years. A list of popular vidiadhar surajprasad naipaul quotes are given below.